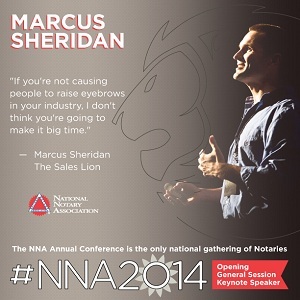 In his keynote address, Sheridan will share how Notaries can use simple content marketing and social media techniques — such as using a blog to share helpful news and information about the services you offer — to draw in new customers and position yourself as the “go-to” Notary in your area. Sheridan, who started his own swimming pool business in 2001, overcame the collapse of the housing market and turned his company from the brink of bankruptcy to one of the most successful in the pool industry. Sheridan launched his own blog, The Sales Lion, in 2009, to help other small businesses overcome tough marketing and economic challenges using real-life, proven techniques. Register today to experience Sheridan's keynote, and to take advantage of this once-a-year opportunity to learn and network with top industry professionals and some of the most experienced and successful Notaries in the nation.